I thought, for my last post of the year, it would be interesting to review FASD happenings in 2016. At first I thought I wouldn’t find much, but I found it’s been a busy year! One of the top stories was from researchers at the Centre for Addiction and Mental Health (CAMH), in Toronto, Ontario (Canada), who identified 428 distinct disease conditions that co-occur in people with Fetal Alcohol Spectrum Disorders (FASD). For those that are not aware: FASD is a broad term describing the range of disabilities that can occur in individuals as a result of alcohol exposure before birth. The severity and symptoms vary, based on how much and when alcohol was consumed, as well as other factors in the mother’s life such as stress levels, nutrition and environmental influences. The effects are also influenced by genetic factors and the body’s ability to break down alcohol, in both the mother and fetus. The 428 co-occurring conditions were identified from 127 studies. These disease conditions affected nearly every system of the body, including the central nervous system (brain), vision, hearing, cardiac, circulation, digestion, and musculoskeletal and respiratory systems, among others. ifferent Canadian surveys suggest that between six and 14 per cent of women drink during pregnancy. It’s estimated that FASD costs $1.8 billion annually in Canada, due largely to productivity losses, corrections and health care costs, among others. “It isn’t safe to drink any amount or type of alcohol at any stage of pregnancy, despite the conflicting messages the public may hear,” says Dr. Lana Popova, Senior Scientist in Social and Epidemiological Research at CAMH, and lead author on the paper. The results were published in The Lancet by Dr Svetlana Popova, PhD, Shannon Lange, MPH, Kevin Shield, PhD, Alanna Mihic, MSc, Prof Albert E Chudley, MD, Raja A S Mukherjee, PhD, Dennis Bekmuradov, BASc, Prof Jürgen Rehm, PhD. The information above was provided by CAMH. You can purchase a copy of the research paper: Comorbidity of fetal alcohol spectrum disorder: a systematic review and meta-analysis by clicking: The Report. 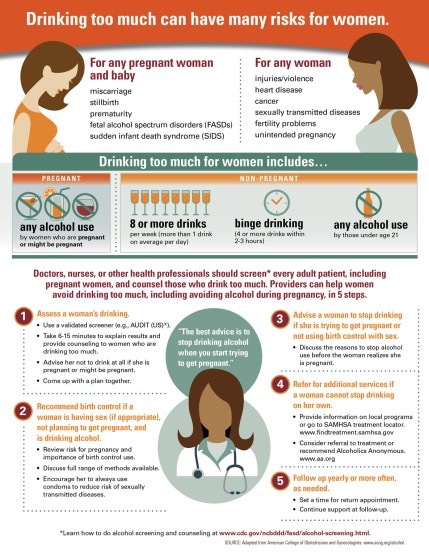 Who could forget the backlash the Centers for Disease Control and Prevention (CDC) received after they released an infographic and statement recommending women of child-bearing age to completely refrain from consuming alcohol if they are not using any contraception in order to reduce the rate of babies born with FASD. Many people felt that the infographic was condescending, blaming, shaming and not naming the responsibilities men have. It also missed the mark in educating the public. The original infographic is below. There were many articles written, but Tara Haelle did a great piece. You can find it on forbes.com. The graphic was changed and now contains information on FASD. You can find out more by visiting CDC FASD. Support for families and caregivers. In his report, Granville Anderson, who led the round table consultations, said FASD prevention is complex but that awareness needs increasing and stigma needs eliminating. The Ministry unveiled a 31-page Report, but as far as I can tell, there has been no movement or updates on progress. The life expectancy of people with FAS is 34 years, which is about 42% of that of the general population. The leading causes of death for people with FAS were “external causes” (44%), which include suicide (15%), accidents (14%), poisoning by illegal drugs or alcohol (7%), and other external causes (7%). Other common causes of death were diseases of the nervous and respiratory systems (8% each), diseases of the digestive system (7%), congenital malformations (7%), mental and behavioural disorders (4%), and diseases of the circulatory system (4%). The program will track the drinking habits of mums-to-be, – which will aid in any future diagnosis and use ‘demonstration dolls’ to show the effects of drink on babies in the womb. Monthly education programmes will be available within the hospital and the community midwifery team will be performing the screening and giving advice. “It ensures that there will be a seamless approach to both the identification of alcohol consumption in pregnancy and subsequent education offered to pregnant women around preventing developmental disability associated with low-level alcohol consumption.” Karen James, Chief Executive. From Hospital site: Tameside & Glossop Integrated Care NHS FT’s HALS (Hospital Alcohol Liaison Service) was established in 2013, and to date the three strong nursing team have now seen over 3400 patients. As this list was compiled solely from people and organizations sites I follow on WordPress, Twitter and Facebook, there was nothing of note I could find for June. 47.3% of women drank alcohol before discovering they were pregnant. This time point is critical as it is the most active time for cell division and differentiation, with the early embryo containing all the genetic codes and information needed for the future development of the foetus. As such, an optimal environment during this period is just as important as the remaining months of pregnancy and peak organ development. Australian women on average reported drinking 3.5 standard drinks a day. This is quite alarming when taking into consideration 50 per cent of pregnancies are unplanned, with the average time point of recognition of pregnancy at four weeks. The early stages of pregnancy see the foetus being most vulnerable to structural damage in the first three to six weeks of gestation. Researchers from Finland, using a mouse animal model reported early maternal alcohol consumption during this developmental period caused changes in brain structure of offspring, particularly in an area of the brain important for learning and memory. Co-author Karen Moritz found the equivalent of five standard alcoholic drinks consumed around the time of conception in a rat animal model altered the development of the foetus. The study showed before the egg implants and any organs start to develop, alcohol consumption causes changes to the embryo. You can read more on the blog for the Prevention Conversation. This awareness campaign was an off shoot of the Red Shoes Rock to Stop FASD campaign which encourages people to wear red shoes and walk, kick, dance or just move in any way to raise awareness leading up to September 9 – International FASD Awareness Day. The FASD IS REAL campaign profiled people of all ages from around the world who are living with FASD. If you have not heard of it, I encourage you to check out the profiles on the Real People website. Many thanks to all the people who shared their stories to encourage others and to Jodee Kulp, Johan Wiklander, Ann Yurcek, R.J. Formanek and Sam Guerrido who were the force behind this campaign. The investigation, led by the University of British Columbia, analyzed DNA samples from 110 children with fetal alcohol spectrum disorder across the country. This led to identifying distinct patterns associated with the DNA of children who were exposed to alcohol in the womb. The study co-author, Prof. Elodie Portales-Casamar of the UBC’s pediatrics department, said the findings are a first step in understanding the underlying mechanisms that alcohol exposure has on brain development. the research team found that methylation, a process that affects how genes behave, differed for children who have fetal alcohol spectrum disorder. More information about the discovery can be found on the CBC News site. October, like June, was quiet. Researchers at University of California San Diego School of Medicine, Texas A&M College of Medicine and the Omni-Net Birth Defects Prevention Program in Ukraine announced they have identified a blood test that may help predict how severely a baby will be affected by alcohol exposure during pregnancy. Seeking to develop a predictive test using biomarkers, researchers looked at birth outcomes for 68 pregnant women enrolled in the study at two perinatal care clinics in western Ukraine. The team obtained detailed health and alcohol consumption histories and second and third trimester blood samples from each woman. The results indicated that moderate to high levels of alcohol exposure during early pregnancy resulted in significant differences in some circulating small RNA molecules called microRNAs (miRNAs) in maternal blood. These differences were particularly notable in mothers whose infants showed some physical or neurobehavioral signs of alcohol effects in the first 12 months of life. The scientists said their next steps will include repeating the investigation in other, larger samples of mothers and infants, and determining if these early markers are predictive of longer term developmental outcomes for children exposed to alcohol. More information can be found on the UC San Diego Health site. We had the potential to end the year on a high note in Canada as our Federal Government was set to vote on Bill C-235 , introduced by the Hon. Larry Bagnell, MP (Liberal) Yukon. The proposed Private Member’s Bill included amendments to the Criminal Code that would require courts to consider a diagnosis of FASD as a mitigating factor. It also called for expedited assessment of individuals. It was first introduced on February 25, 2016: Bill C-235 Introduced and you can watch the Closing Debate. However on December 13, it was defeated. 133 for and 170 against. Statement from Larry Bagnell. Bill Blair, parliamentary secretary to Canada’s minister of justice, said it would be unfair to single out FASD in the Criminal Code. He argued it could open the door to individual consideration of hundreds of separate disabilities and mental disorders, which could immensely complicate the justice system. More information can be found on CBC News. Although disappointing the Bill did not pass, the awareness garnered through the last year on this Bill started many conversations and brought FASD into the spotlight. No matter if it is good news or not so good news, any time FASD is in the news, we are presented with an opportunity to share our stories and increase awareness. and shared my blogs, tweets and posts throughout 2016.
to continue into 2017. Happy New Year! Previous Post: For women, heavy drinking has been normalized. That’s dangerous.